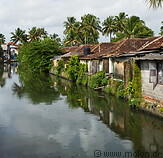 The historic core of Kochi is called Fort Kochi and lies on an island facing the Arabian sea. The primary attraction is the Mattancherry palace, which is also known as the Dutch palace. Initially built by the Portuguese in the 16th century, it was renovated by the Dutch in 1663 and nowadays is used as a museum. Near the Mattancherry palace lie the Pazhayannur Bhagavathy Hindu temple and the Paradesi Jewish synagogue, both located in an area called Jew town, which is full of tourist shops. Other heritage sites in Fort Kochi include the Dutch cemetery and some churches.